The first 30 days are crucial in a new job. You can use these precious first days to form excellent first impressions that can lead to long-lasting relationships in your new organization. 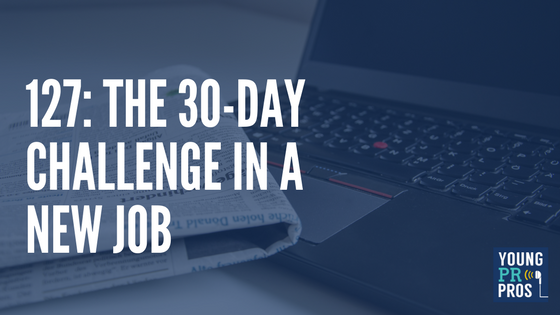 Young PR Pros calls this the 30-day challenge. In this episode our hosts and producer will share their 30-day challenge tips and advice so you can make your first days at a new job count. What should you do in the first month at a new job? First off, Clare did a great job reminding our listeners that new jobs aren’t always all butterflies and kittens. There are good and bad days. It is important to take take it easy on yourself during the first month, take it in strides and make note of those lessons learned (listen to episode 116 for tips on how to learn from your lessons). What else can you do during the first 30 days? Give yourself a goal. PR, marketing and communications professionals are deadline driven. Set a few goals, maybe it is to introduce yourself to each person in the office, or maybe it is to set up alerts on industry news and learn about the industry. Avoid heavy lifting – spend more time learning. Ross says you should learn as much as you can, learn the corporate structure and immerse yourself in as much things related to the company. A lot of success happens when you fit your good ideas into a corporate framework – i.e. understanding how new ideas can flourish in your new company. One easy way to do this is to read as many news releases published by the company, this gives you a good idea of what is going on in the organization as well as their industry. Sit down, stay humble. This is not the time to be proud. Take criticism, remember you are new and it is inevitable you will not be the expert on certain things. Also, 9/10 times your amazing bright idea has probably already been presented before. Take this opportunity to learn from your new team. But humble shouldn’t lead to impostor syndrome. You got the job, you deserve to be there. Bring in food – people love the employee who shows up with treats! All first impressions are important, doesn’t matter what their title is. Don’t underestimate the relationships you will build with a receptionist or executive assistant. What happens if you are running around last minute trying to print a proposal that is due in less than an hour. The printer breaks and you have no idea what to do. If you didn’t make a good first impression with that receptionist, good luck getting things working in time to send that proposal. So what did our hosts learn during this episode? Clare learned it is a really good idea to make a map of the office. If you have a hard time learning names, a map of your office with names and notes about each colleague will help you remember your entire new team. Ross is reminded that the first 30 days is very stressful. As a boss now, he will definitely remember to help his team members celebrate the wins and recognize the low days, while remaining neutral towards both. Kristine says the one word she took away is: respect. Respect your new team, respect the job, respect the organization. Sit down, stay humble! This entry was posted in Young PR Pros podcast and tagged 30 day challenge, career, career advice, clare bonnyman, communications, data, first 30 days, julia kent, kristine d'arbelles, new career, new job, PR, professionals, ross simmonds, young pr pros, youngprpros by Kristine D'Arbelles. Bookmark the permalink.